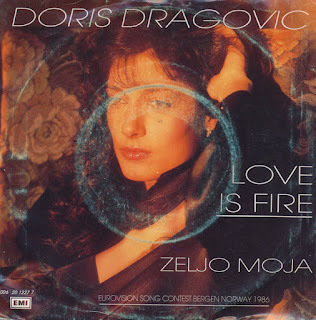 The Yugoslavian entry for the Eurovision Song Contest in 1986 was performed by Doris Dragovic. She sang the dramatic love ballad 'Zeljo Moja' ('My desire'), translated as 'Love is fire' for the international market. The song finished eleventh in the contest, in a field of 20 competitors. Doris actually returned to the contest 13 years later, with the dynamic song 'Marija Magdalena', which fared a lot better: on that occasion she finished in fourth place.